You can't really define funky, you just know it when you see it. You can’t really define funky, you just know it when you see it. I’m not talking about the musty odoriferousness of a Flatbush Avenue dollar van, but that unquantifiable quality of cool, magnetic, hypnotizing brilliance that only a true artist can conjure. The funk drips from Phife Dawg‘s lyrical Muay Thai lyricism, as it does on a Steph Curry boom-bap that leaves defenders weak in the knees. 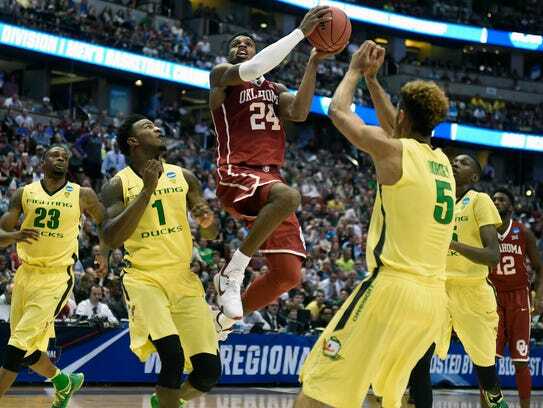 You simply know it when you see it, and the University of Oklahoma’s Buddy Hield, offered up some serious Machine Gun Funk with his performance last night against top-seed Oregon in the Elite Eight. A few weeks back, we debated who deserved to be named the National Player of the Year. Buddy Hield made that conversation null and void last night, scoring 37 points and carrying No. 2 seed Oklahoma past No.1 seed Oregon in the West Regional Final, 80-68, for a berth in the Final Four in Houston. Hield seemed to channel his inner Kobe Bryant, the player he once dreamed of being while growing up in the Bahamas and the reason why he wears jersey # 24, who happened to be in the stands enjoying the performance like everyone else. Hield blazed immediately after the tip-off with some supreme Machine Gun Funk, with three of his first four baskets splashing from deep. He had 11 points in the book with a little more than five minutes elapsed in the opening period. Overall, Oklahoma hit 12 of their 24 attempts from the three-point line. In addition to Hield’s pyrotechnics, Oklahoma benefited from their other other talented backcourt members, Isaiah Cousins and Jordan Woodard. Cousins, a 6-foot-4 native of “Money Earnin'” Mount Vernon, New York, chipped in with 11 points, five rebounds and seven assists while the 6-foot Woodard, from Arkadia, Oklahoma, scored 13. Hield, Cousins, Woodard and senior forward Ryan Spangler were making their 104th straight start together, and they play with a familiarity, intelligence and emotional solidarity that most college teams could only dream of summoning. But the game was all about Buddy, who had everybody going nutty from start to finish. Oklahoma, who has advanced to the Final Four for the fifth time in school history, is gunning for the school’s first-ever national championship in men’s basketball. The great thing about Hield, though, is that at the post-game press conference, instead of being inebriated with his point tally, he frowned when perusing the stat sheet and learning that he had six turnovers. How special has Hield’s season been? Well, put this in your pipe and smoke it: he’s one of only four players, along with Indiana State’s Larry Bird, Georgia Tech’s Dennis Scott and Michigan’s Glen Rice to appear in the Final Four while averaging over 25 points per game. Hield, the two-time Big 12 Player of the Year, scored 17 points before halftime, punctuating his first half performance by banging a 3-pointer from El Segundo which put the Sooners up 48-30. He’s erupted for 30 points or more 12 times this season and is now the second-leading scorer in Big 12 history, trailing only Baylor’s LaceDarius Dunn. Hield and his experienced Sooners crew will face fellow No. 2 seed Villanova in the National Semifinals on Saturday night in Houston.